This pullover is knit using Jamieson's Chunky Marl 100% wool yarn and is from Simply Shetland. The design is by Gregory Courtney and is classified as an "Intermediate" skill level. Yarn kits for 3 sizes are detailed below. 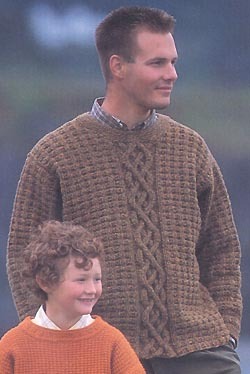 The child in the foreground of the picture is wearing the Prince Caspian Pullover.